victorsra wrote: The Portuguese Rugby Union http://www.fpr.pt/ lists Romania vs Portugal in Bucharest on November 9th now. On a Friday? Such an important game should be on a Saturday or Sunday. That would open up the chance of Kenya playing the full Romanian team then? dwpeate wrote: That would open up the chance of Kenya playing the full Romanian team then? Not a chance. But I think we will field a much better side than we did against England Countries. Much, much better. I think. I don't think Friday night is bad. I prefer to see Brazil playing on Friday nights as there is no football top division matches here on Friday nights (it is second division day) and there are no club rugby matches. But in other countries Friday is an important day for football. Don't know how it is in Romania. So I think it varies from country to country. World Rugby has the Romania v Portugal game on the 3rd still? Friday night game will make it hard for Portuguese supporters to make it. suofficer wrote: World Rugby has the Romania v Portugal game on the 3rd still? Maybe the Portuguese union put friday because it is the day they fly do Bucharest? Europe Cup for Nations' (former FIRA Cup, former... now REC) medal tally, If I assembled correctly the wikipedia data. Canalina wrote: Europe Cup for Nations' (former FIRA Cup, former... now REC) medal tally, If I assembled correctly the wikipedia data. It will be the 48th edition, if you count the tournaments on the same page [edit: https://en.wikipedia.org/wiki/Rugby_Europe_International_Championships], and the 17th as European Nations Cup/ RE Championship, thus, since its placing inside the pyramide as the second tier championship under the six nations. edit2: Georgia has 2 Gold medals too much in this table. Even under all formats they have only 10 titles to their name. When did the Soviet Union win it? 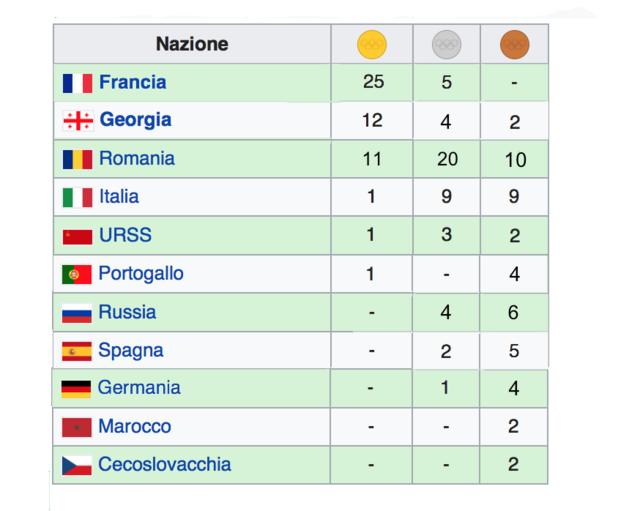 Ex aequo on edition 1989-90, according to the italian wikipedia page; France, URSS and Romania finished withe same points, the french team had the best points difference but that wiki page says the trophy was awarded to all the three nations. Canalina wrote: Ex aequo on edition 1989-90, according to the italian wikipedia page; France, URSS and Romania finished withe same points, the french team had the best points difference but that wiki page says the trophy was awarded to all the three nations. Interesting fact. The English and Italian article of the tournament, not the overview, cites Stepehen Jones' yearbook, but is there any official website, final classement? If it is true, one should update the overview article on wikipedia. WHEREAS ROM LOST TO POL = HARD TO BELIEVE ? Romania A wins against Poland at home with only 25-19 on 8.04 because the first team wins in Italy with 16-9 on 14.04 (less than a week time). It was a strange tournament with many" A" teams involved and strange results. Like Romania lost on their own turf against URSS and then wins their only away victory against France in Auch. Of course that Romanian side says it was a tie tournament beetween us, France and URSS. 4) Are there TWO Stephen Jones' ? If NO, how can we trust that notorious freak -- and in non-UK matters? It is always the one who tell the news to be trust. So yes it is pretty strange to share a title in 3 . Bogdan_DC wrote: It is always the one who tell the news to be trust. So yes it is pretty strange to share a title in 3 . It was the same in 4N/5N. IIRC only when they expanded it to 6 they got rid of the shared titles. If you add up the number of titles each nation has you will see there are more of them than the number of times the competition was played. I didn't say it is not true, i say it is strange.